New social sciences teacher Amanda Walker is no stranger to Nayland College. This year she returns to us after once being a student here. Mrs Walker began her teaching career as an English teacher at Buller High School on the West Coast. She and her husband enjoyed the rugged environment there. Following that she taught at Waimea College and that’s where she began to teach social sciences. This year she is teaching social studies at Years 9 and 10 and history from Years 11-13. 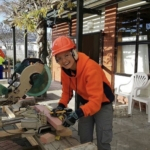 Mrs Walker and her husband have also spent time over the last years doing volunteer construction work in South Auckland, Fielding, Blenheim and in Niue. They will be going back to Niue for another stint later this year. When she’s not working, Mrs Walker enjoys getting out for a run and she commonly runs 10km. At the moment she’s training for the upcoming Blenheim half marathon, so she’s about to increase her training distance. It’s no surprise that Amanda Walker enjoys reading and watching films. She lists ‘The Darkest Hour’ and ‘Green Book’ as two recently-watched films she’d recommend. An avid historical fiction reader, she’s now made it a goal to read more non-fiction as well.